The latest effort from Disney’s Pixar is the Golden Globe winner for Best Motion Picture in the Animated category, Coco. 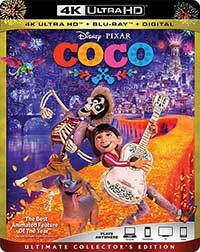 This marvelous heartfelt adventure from directors Lee Unkrich and Adrian Molina takes us to Mexico where the young aspiring musician Miguel (voiced by Anthony Gonzalez who was cast after some time voicing the role as a mere stand-in while they searched for a permanent voice actor) is confronted by a longstanding family ban against music due to a musical ancestor who abandoned his family to pursue his own musical dreams. But when the annual Dia de los Muertos (Day of the Dead), festival comes around, determined to perform mariachi in the local town square, Miguel goes to borrow the guitar from his idol mausoleum, which, after he strums it, sends him straight to the land of the dead; you’re not supposed to take from the dead on this dead, but give to them. In the land of the dead, Miguel must get the blessing of his dead ancestors to return to the living and he encounters members of his family, including his great-great grandmother Mama Imelda (Alanna Ubach) who wants to send him back to the living, but under one condition – that he not play music ever again. That’s when he embarks on a quest to find the one ancestor he’s sure will give him his blessing without conditions — de la Cruz . On his quest he meets a scraggly musician named Hector (Gael Garcia Bernal) who says he knows de la Cruz. Both Miguel and Hector have major problems, however, and those are Miguel must secure a blessing before sunrise or get stuck in the Land of the Dead forever and Hector must get someone on the lad of the living to remember him or disappear forever. Coco is a beautiful, colorful film, not the sort of film visually one might expect from the outset for something set in the land of the dead. For any parent concerned about that, this is vivid and full of life, even if for much of the film the majority of the characters are skeletons. Pixar’s amazing animation work brings even the skeletons to life with their facial expressions and motions. And the world of the Land of the Dead is a multi-tiered, brightly lit dreamscape decorated with lanterns and papel picado. Coco may be the strongest film from Pixar in a long time. While the story does tend to slip a little toward family drama cliché, it makes up for it with major heart and the can-do spirit it instills in young people. Young Miguel’s journey takes him from being at odds with his family to learning about how important family is, which is a simple story and a common journey, but it is handled well and the final act ties together very well. Adults watching will be hard-pressed to hold off the the tears unless they are completely soulless. 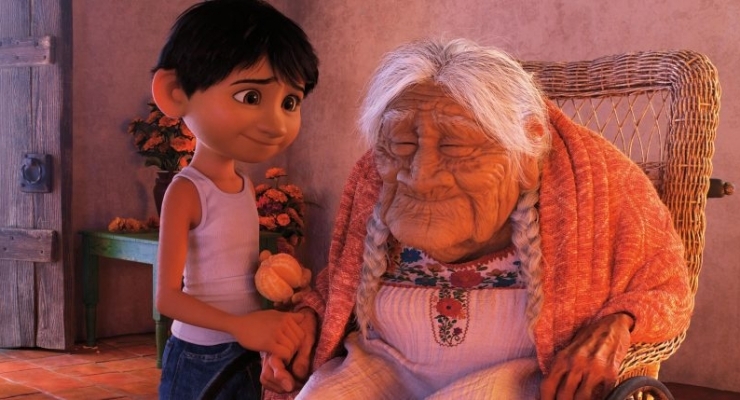 COCO (Pictured) - FAMILY BONDS - In Disney•Pixar’s “Coco,” Miguel (voice of Anthony Gonzalez) has a very special relationship with his great-great-grandmother, Mamá Coco (voice of Ana Ofelia Murguía). Directed by Lee Unkrich and co-directed by Adrian Molina, Disney•Pixar’s “Coco,” opens in U.S. theaters on Nov. 22, 2017. ©2017 Disney•Pixar. All Rights Reserved. The digital animation for Coco was processed with Dolby Vision HDR but arrives on 4K Ultra HD with HDR10 HDR in an HEVC 2160p encodement framed at 2.39:1. The colors look stunning thanks to the wide color gamut of this format and switching to the equally clean Blu-ray looks flat and washed out. Disney lists Coco as having an Atmos “7.1.4” mix, which is not really a thing since Atmos (and DTS:X) are object based and not channel based. One’s audio equipment may limit one to a 7.1.4 setup, but not necessarily. It can scale to far more overhead channels than that. That said, the mix is good and in keeping with the Disney-Pixar style. It’s not overly aggressive, but it has a good balance and enough mixture of solid effects into the surround channels and plenty of ambience in the overheads. Dynamics are superb, offering plenty of overhead without ever getting too loud. Mi Familia (1.78:1; 1080p/24; 00:10:00) – The crew discuss weird rules their fmily had. The Music of Coco (1.78:1; 1080p/24; 00:13:12) – This featurette goes behind-the-scenes on the musical score for the film. Fashion Through the Ages (1.78:1; 1080p/24; 00:08:39) – A discussion on designing the various fashions for the film. Paths to Pixar: Coco (1.78:1; 1080p/24; 00:11:44) — The crew discuss how they made their way to Pixar and eventually working on this film. You Got the Part! (1.78:1; 1080p/24; 00:02:12) – The young voice of Miguel is awarded the role of a lifetime. A vibrant, heartfelt adventure that teaches about the importance of family and dreams, this Golden Globe winner is a likely shoe-in to win the Oscar for Best Animated Feature and looks and sounds fantastic on 4K Ultra HD. A Mexican boy (voiced by Anthony Gonzalez) who aspires to be like his musical idol, but is facing an a family ban on music, finds himself swept into the Land of the Dead during the annual Dia de los Muertos festivities where he goes on an adventure to find his idol who, as it turns out, is his ancestor, in order to gain his blessing to return to the land of the living in this heartfelt, visually vivid story from Pixar Animation that emphasizes family and chasing one's dreams. The voice cast put in solid performances and the 4K Ultra HD release with HDR10 emphasizes the brilliant color pallet that leaps from the screen.